Meet a real astronaut at the arrival meet and greet! 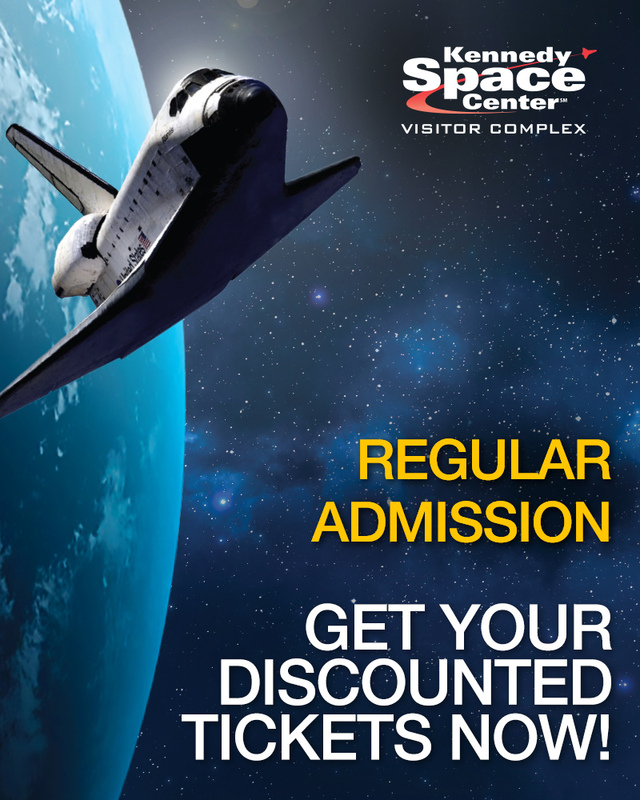 * Visit exhibits, displays, historic spacecraft, memorabilia, shows and two IMAX theaters. *Promotion currently running - exclusively for guests of KGS Tickets. These terms and conditions are a binding contract between yourself and Kissimmee Guest Services or one of it's retail websites www.ticketmomma.com, www.kgstickets.com, www.ticketmania.com, www.discountticketsorlando.com, www.floridatickets.net, greaterorlandodiscountickets.com,orlandosavings.com, orlandowelcomecenter.com. AGREEMENT OF THESE TERMS IS EQUIVALENT TO A DIGITAL SIGNATURE ON A CONTRACT. ALL SALES ARE FINAL. CANCELLATION OF AN ORDER IS NOT PERMITTED AFTER THE ORDER IS PROCESSED. Waiver: All activities are at the users own risk. Kissimmee Guest Services acts as a ticket agent only and shall have no responsibility for any loss, injury or damage to person or property however caused. By receiving this e-ticket you acknowledge that Kissimmee Guest Services and our agents, employees and related entitles (i) have not made any representations regarding the safety of any activity and (ii) are exempt from all liability or responsibility whatsoever for loss, injury or damage to person or property. Refunds: We do offer refunds, however there is a 10% restocking fee for all refunds. Refunds are only available for orders that have not been shipped or picked up. Once orders are shipped or picked up, there are no refunds. KGS Tickets, Inc or any of it's affiliate website www.ticketmomma.com, www.kgstickets.com, www.ticketmania.com, www.discountticketsorlando.com, www.floridatickets.net, greaterorlandodiscountickets.com,orlandosavings.com, orlandowelcomecenter.com. does not assume liability for damages as a result to the use of any service, product or any material found within this web site. This may include but is not limited to the use of the website system, any content or demonstrations accessed via this web site or any other site to which the web site may be linked to. We reserve the right to modify any material within this web site including but not limited to: product/ and service descriptions at any time without notice. The information posted is believed to be accurate and reliable at the time it was posted. We do not take responsibility for its use, nor for any infringements of rights and or patents of any third parties resulting from the use of the website. Links from third party websites from this site are provided solely as a convenience.